Spring can be such a busy time as we clean, plant, socialize, exercise more and create whatever we wish to grow this year. Balance your energy this spring by scheduling time to do absolutely nothing. There is immense value in resting. 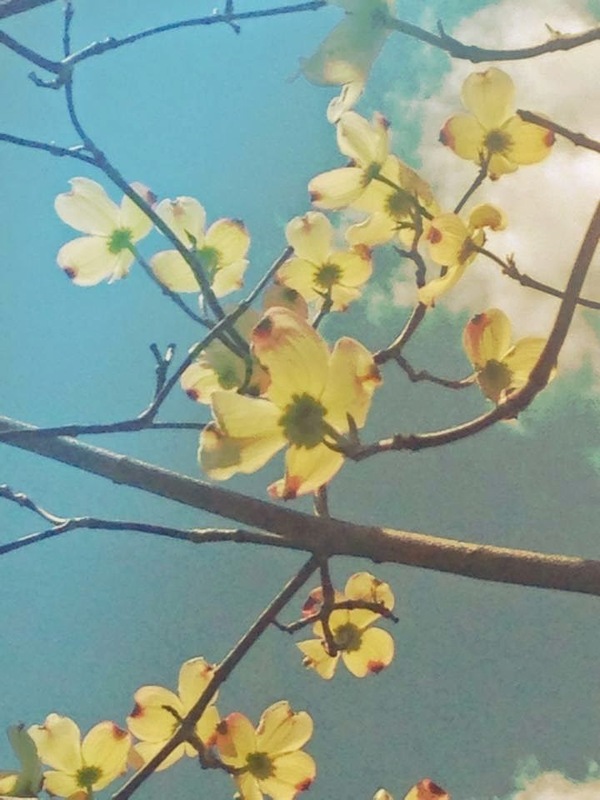 Today while I was running early to my next destination I was able to experience the gift of rest when I stopped by a local park to admire blossoming trees. I sat on a park bench and grounded myself for a while. Everything I saw, heard, felt and smelled recharged me for the rest of my day. Now that Mother's Day gorgeous weather days are around us, allow yourself to stop every once in a while to sit with Mother Earth and be nurtured by her. You will return to your schedule with a blissful glow. Traditional Chinese Medicine suggests we embody the 5 elements of nature: earth, water, fire, air and metal. When the seasons shift the elemental balance within us changes and we can either feel fine or out of balance. Spring is associated with the wood element according to Traditional Chinese Medicine. Wood which has been at rest during winter, now bursts forward with new buds blooming and green life emerging from the earth. The greatness of the evolving trees during spring initiates a rush of rising and renewing energy. If you followed nature's cue and rested this past winter, you like nature may feel enthusiastic to move forward with clear vision and a sense of doing purposeful work. When the wood element is balanced within, you are extremely confident and motivated. You have the ability to envision the future and make strategic plans. You sway like tree's branches during springs windiest of days in addition to going with the winds of change rather than against it. You love growing! When the wood element is unbalanced within, you lack all that's mentioned above. Confidence is replaced with control, planning becomes impulsive and insecure behavior plus ambition turns to anger. Physical signs of a wood element imbalance are headaches, visual disturbances, digestive problems like heart burn in addition to high blood pressure, muscle tension and sciatica (nerve swelling that originates in a hip and runs down a leg). Since the mind and body are connected according to Traditional Chinese Medicine, to treat the emotional and physical imbalances associated with the wood element you must treat the liver and gall bladder. Receiving acupuncture, acupressure and/or seeing a TCM specialist for herbs are excellent routes to feeling good. However my speciality is of course yoga and I'm happy to share that there are several yoga and restorative postures you can practice during springtime that will strengthen and ease the wood element/liver and gall bladder meridians within your body. I find it funny and easy to remember that tree pose is one of them. Follow me on my blog Glamorous Yogini and on Instagram @allisonegandatwani where I'll be sharing wood element balancing yoga practices to do now and throughout May. In the meantime here are some wood element balancing lifestyle choices you can adopt now and see if you notice a difference in a week. I have! Exercise: Go for long walks in nature and witness all that's blossoming around you. Spring Clean: Give away or throw out whatever is unused and taking up space in your home, work and play space. It served it's purpose in the past however you will notice once your clutter is cleared that you will have room to clearly envision what's next. Eat Fresh Food: Spring's warmer weather is a perfect time to say goodbye to winter's comfort foods and welcome the wider variety of fresh produce that's making its way into the market. Avoid fried food, white sugar and flour and of course chemicals. Practice Forgiveness: TCM suggests holding a grudge can do damage to the liver. Let go of anger and resentments and practice love instead. Do Something New: To align with spring's growing and transformative vibe try something new. Think of something you've been interested in yet never dove into it. It can be a small attempt into something new like taking a cooking class or wearing a new hairstyle. You will never know what you're capable of until you try! Replace shyness and fear with playfulness this spring. Drink Water: You can never go wrong with hydrating yourself with plenty of water. I carry a liter of water with me everywhere I go and drink it throughout the day. When I don't, I feel sluggish and irritable. *I credit the site www.fiveelementhealing.com along with a handful of loving teachers along the way like Jason Ray Brown and Frances Taylor Brown for inspiring me with Traditional Chinese Medicine wisdom. This past weekend's warmer spring weather reminded us of how there's nothing better than feeling the golden sun on our skin. I noticed plenty of bicyclists, joggers and walkers on the sides of the roads as I was out and about. I was inspired to take in the sun's strength so I practiced plenty of yoga outside. I know the great weather caused me to over do it and now I'm paying for it as I'm feeling weighed down on Monday morning. Did you over do it too? Balancing fun in the sun otherwise known as spring fever and keeping up with the demands of getting things done is key in feeling good. Join me, Ileana Abrams and Loren Abrams this coming Saturday April 18th at 2pm for our Spring Training Yoga Workshop at Bamboomoves Yoga in Palisades Park, NJ. Here we will attune to the seasonal shift with a complimenting grounding practice followed by a vinyasa flow warm up that will lead us into breaking down 3 strong and blossoming postures pictured in this post. We will use yoga props like blankets, blocks, bolsters, yoga straps and the wall to find these postures. Plus you will have 3 sets of hands assisting and adjusting you as you find your expression of these asanas. From there you will sit in these postures and feel how their healing qualities are perfectly appropriate to balance your energy during our current blossoming season. Our workshop will conclude with restorative yoga postures for you to rest and renew your energy while being guided through an energy cleansing and recharging meditation. Visit www.bamboomovesyoga.com Palisades Park and click into workshops to register. You can't notice the air's super cold and windy mood from these images yet I was determined to have my husband snap a pic of me and my youngest son in a favorite nature spot before it blooms. Since the wind was fierce, initially my posture choice was to curl up and hide from the wind but when I tuned into the tree's branches happily shaking loose above me, leftover fall leaves gracefully floating to another resting spot and the hypnotic sound of the water's waves breaking along the riverbank behind me is when I realized nature was having a good time going with the flow, why wasn't I? Wishing things were different is an all to normal feeling yet one I try to catch myself wasting time in and letting go of. Noticing early spring's recent windy days and my environment's reaction to it has given me some insight into non grasping. What I've noticed is when I take the time to slow down and become aware of my surroundings, I can see it is perfect just as it is. My need to control my current situation diminishes and acceptance emerges within me. Feelings of compassion to others including myself surface, making me open to receive what's next. During this particular nature visit what started as a defensive fetal like pose blossomed open into Compass Pose as I let the cold wind cleanse me. Like a tree who sheds leaves in the fall and blossoms in the spring, you need to let go to renew. The next time you experience a cold and windy spring day, let it refresh and guide you into spring's new phase. April has arrived and life is becoming greener with crocuses emerging from the earth, fresh cut tulips by my bedside and new opportunities smiling at me. If you're having trouble noticing what's pushing through the darkness of the earth for you right now, I suggest taking a moment to become quiet and observe. Write down what you notice. It can be a long essay with pen and paper or a few words typed into your phone's notes. The beauty of journaling is that it gives you the ritualized space to reflect on your current situation. When you do you're less likely going to miss the unfolding energy of seeds that you've planted. Instead you can nurture what you wish to grow. My writing tip is to spend some quiet time in nature and tune into the rhythm of your surroundings. Write down what comes to you and enjoy.